We’re here to set the record straight – Madrid is super vegan-friendly. There are 26 vegan restaurants in Madrid plus six bakeries/smoothie/juice spots and three vegan grocery stores, which puts it in the top 10 most vegan-friendly cities in Europe! Most people think that in the land of jamón (Spanish cured ham) vegan options will be few and far between, but that’s just not true in the Spanish capital. Yet we’ve come across many guides labeled “complete” that don’t even mention half the vegan places available or don’t include the date the article was written and places have since closed. Rest assured, this is for vegans and vegan-curious, written by vegans. We use the “ultimate” title sparingly and only for places where we’ve lived at least a few months and can do in-depth research (yum) with repeated visits (yum yum). At the time of this writing, we have lived in Madrid for almost two years. There’s another record to set straight – this is no longer the ultimate vegan guide to Madrid. Sure, this is called the Ultimate Vegan Guide to Madrid, and it’s the most comprehensive guide online, but something else has emerged that’s five times bigger and better. However, if a guidebook is too big a bite for you right now, have a taste of the detailed thoroughness we put into our online guides. While there are accidentally vegan options in Spanish food, Madrid boasts a vegan scene exploding from infancy. After almost two years of living in Madrid eating our way around the city, we’re here with another update to our ultimate vegan guide to Madrid. In just under six months, six more vegan restaurants in Madrid have opened up! Not to mention more vegan options all around. In this ultimate vegan guide to Madrid, we include every one of the 26 vegan restaurants in Madrid, vegan bakeries, the best vegetarian restaurants in Madrid, and places with notable vegan options. We give our general impressions and the best dishes the place has to offer to optimize your visit. If you want to dive deeper into the food scene here, check out our two separate guides on vegan menú del días (a weekday lunch special) in Madrid and vegan tapas (small dinner plates) in Madrid. Our only other “ultimate” vegan guide thus far has been our Ultimate Vegan Guide to Salt Lake City. While you may not be able to try everything like us, we hope to narrow things down for you so you can spend more time enjoying Madrid. Keep in mind Spanish meal time hours: lunch is from 1 – 4 pm, and dinner/tapas between 8 – 11 pm (sometimes on weekends places will serve until midnight). You won’t be able to order food in between. Eating at vegan restaurants in Madrid may take more time planning than you’re used to but it’s well worth it. Also, note that big western style breakfast isn’t really a thing here. Also, the Spanish do not like spicy hot dishes – that’s Mexico and other Latin American countries you’re thinking of. If it’s labeled picante it may be bold in some flavor, but hardly spicy to our American standards (and we’re not that into spicy). But this isn’t everything to say! Check our Top Ten Tips for Eating Vegan in Spain. Price Guide: Compared to the NYC (or eating out in the U.S. in general), Madrid is crazy cheap. “AT FAV” = Alternative Travelers Favorite. Any restaurant with this abbreviation means we love it and go there frequently. Without further ado, let the guiding commence! There are 26 vegan restaurants in Madrid and two fully vegan bakeries according to HappyCow. Basically the vegan Yelp, we use it whenever we travel and to keep up to date on listings. However, it’s always a bit difficult to gauge review reliability because not everyone has the same expectations for eating out. For us, going out to eat means at least two things: at least a little indulgent (but not just relying on fried greasiness) and something that we can’t make better ourselves – creativity is a big plus. It’s important to understand where we come from as vegans. Smoothies for breakfast and salads for dinner are daily homemade affairs. Hence, we don’t go out to eat salads and smoothies. Not pictured: smoothies, salads, or buddha bowls. Generally speaking, Spanish establishments tend to serve rich, indulgent food. Even salads will have generous amounts of dressing. Avoiding oil and processed foods is not impossible but if that’s your goal, you must be scrupulous. If you see burgers and hotdogs on a vegan menu, expect a food that emulates the original – processed and fatty – unless otherwise noted. The following are all the vegan restaurants in Madrid listed in alphabetical order. Traditional Spanish bar food made vegan. This is a first-come, first-served casual restaurant – those quickest to order their food, win. Very popular. We frequently bring out-of-towners here and everyone always loves it – omnivores included. We recommend: tapas – the tortilla (potato omelette), the estilo pollo (faux chicken) and linda (faux beef) burgers, the calamari and chorizo bocadillos (sub sandwiches). Notes: Cash only. No reservations. No menú del día. Gets crowded. Get there before it opens and expect a line. An expat couple runs this chic nontraditional establishment with incredibly artisan-made food. They have unparalleled transparency in their methods and ingredients (open kitchen, open storage) – everything is made in-house and is comida ecólogica (European Spanish for Organic) so expect an appropriate markup. Also serves large salads – don’t order them unless you love your greens. We’ve been here many times and it’s always consistently excellent. We recommend: everything. We had one of the best muffins ever here and it was gluten-free! Great seasonal dishes like pumpkin pie. Definitely don’t miss dessert! Notes: No reservations, and non-traditional seating – you sort of sit wherever there’s space for a plate. All Organic. Super cool interior of recycled materials, friendly owners, super chill music, and an overall relaxing vibe. They expect you to stay a while – like the name suggests. Offers brunch every day and a menú del día. The owners make beautiful plant milk coffee art – who says you need moo juice to do that? We recommend: the coffee, brunch, tortilla and baos (a small Chinese style sandwich). Also the desserts! Many are supplied locally but the amazing chocolate banana bread is housemade. Notes: It’s a cafe, so it’s not open past 8pm (or 10 pm on weekends). Off center Venezuelan-run bar and restaurant offering all vegan lunch and dinner. The stoic vegan owner perfectly embodies the calm and collected interior. The Friday burger menú del díá. Come for: menú del día and the exhibition art space below. Every Friday there’s a weekly changing burger menú for 12 euros. Notes: Off center location. Happy Cow lists as all vegan, but at breakfast, they serve vegetarian food with vegan options – chances are you won’t be here at this time if you’re visiting. The food is incredible, and definitely worth it. While this can easily cost you three times as much as the rest, an experience like this in New York City (where we’re from) would be at least four times the cost of this place. Come for: an upscale raw gourmet vegan fine dining experience. We recommend: coming here for a special occasion. If you want more specifics – check out our Vegan Madrid Guidebook. Artisan, yeast-risen donuts that are so delicious you’ll wonder why all donuts aren’t vegan already. As we proclaimed our love for these donuts, the owner overheard and said, “Wow, that’s saying something as you’re from New York! Thank you!” We know our donuts and these are perfection. Expect an assortment of icings and toppings that align with the seasons. These are several steps above the donuts in any old Spanish pastry shop, so expect an appropriate markup (2.50/donut). We recommend: donuts, of course, but also to enjoy their delicious pumpkin spice latte (Sam just had to). Note: Small – not a lot of seating. Tucked away right outside the neighborhood of La Latina sits this precious Italian run mini cafe. Expect to find top-notch imported Italian goods such as pastries and savory goods. There are even biodegradable/compostable cutlery and plates/cups! The gregarious owner is from Italy and has lived in Madrid for 12 years. We recommend: the strudel, the croissant, the Italian Espresso, sorbet: mango, coconut, and melón. Notes: A short walk west of La Latina, but then you’re that much closer to the Rio Manzanares. Currently no website. Address: Calle Segovia, 55, Madrid (Metro: Puerta del Ángel). If you’ve been following our Madrid guides, you’d guess correctly that this is one of our favorite spots. A super friendly and chill family run bar-restaurant with a plato del día (plate of the day), tapas, rotating desserts, a selection of craft beers and wine, and gluten-free options. They are always trying new things, and we can’t imagine how one goes wrong here. Everything is made from scratch and they’re at the leading edge of creative, indulgent vegan food in Madrid. This year, for the second year in a row, they’ve won first place in the popular vote for best tapa in the annual tapas festival Tapapies. And this wasn’t a vegan festival! In our humble opinions, they have the best vegan tortilla in Madrid too. Read our article on Green Living Spain on where else to find great vegan tortilla in Madrid! We recommend: everything but especially their award-winning croquetas, their cakes, and their Saturday tortilla. We bring every visiting friend here and they’re always impressed. Just know this is indulgent food – the nachos and hotdogs are not kale chips and healthy dogs. Note: Small space and always packed – make reservations online. A very local spot run by a shy but sweet couple in our old neighborhood. Everything is homemade and low key. Expect to see satisfied omnivore locals curiously asking about what their meatballs were made of. The best homemade vegan meatballs in Madrid! Even the nonvegan construction workers were quite curious what they were made of. We recommend: the cheapest vegan menú del día at 8.50 only rivaled by La Oveja Negra, but with more generous portions. Tapas are solid here too – go for the albóndigas (meatballs), generously topped veggie burger, and moist cakes. Notes: Really close to Atocha train station if you want to hang somewhere before catching a train! Let cake freedom ring! This new dessert spot offers an impressive display of beautiful cakes. There’s a flavor for everyone here. This would be impressive on its own but they also offer traditional Spanish style cake called bizcocho and cookies as well. We recommend: chocolate lovers – go for the Muerte por Chocolate (Death by Chocolate), though there are a TON of flavors and combos. Not to be confused with Hakuna Matata (located in the center), this excellent addition to Madrid resides in the north of center neighborhood of Tetuán. They have a weekly menú del día on weekdays, and tapas every day. It’s hard to go wrong here – we love it all. The escalope and pisto – tastes as good as it looks! We recommend: reading our Best Vegan Tapas guide in Madrid, as it’s included amongst many others! Specialty coffee shop with quiches (pumpkin or spinach based) and a display case filled with creative and traditional homemade desserts. Quiet place for getting some work done as they have an additional basement space expressly for that purpose. We recommend: the pumpkin quiche, pumpkin chocolate brownie, the fatay (a savory stuffed Lebanese flatbread) and the lemon meringue. Notes: Unfortunately it seems like they do not take U.S. credit cards anymore (citing a 30 cents upcharge for them), so don’t plan on using your travel credit card here. It is a coffee shop first and foremost – don’t expect a menú del día or extensive tapas. We are also sad to report, that as of late, their customer service has been really bad – rude and condescending. It’s especially disappointing as we were regulars here (we’ve lost count of visits), and even this didn’t save us. Several of our friends have reported similar experiences. While we know that Americans are notorious for complaining about any service that doesn’t dote on them – this isn’t the case – so considered yourself warned. It’s a shame because we really loved the food and the place. An all comida ecólogica (organic food) vegan spot that uses lots of raw and gluten-free ingredients. They have a menú del dia and tapas. Great cozy chic interior and friendly staff. They have a super stocked bar with many local craft beers (not common in Madrid), vermouth on tap, and carrot wine! Stuffed eggplant from the menú del día. We recommend: the menú del día, a good match of price and portion. The tapas are delicious but consistently too small for the price. Note: accepts reservations, but the interior is spacious and walk-ins are possible. All organic ingredients. Unabashedly unapologetic feminist dive bar and restaurant with a selection of cheap bar food. Vaginas adorn the walls and there’s even a feminist board game. Be wary of faux meats here (don’t get the rubbery seitan). Has menú del día and tapas. Come for: The scene if it’s your thing. Has the cheapest menú del díá at 8.50 though it’s not always a win. We recommend: the merienda (snack) deal Monday through Thursday, 5-8 pm: Buy a coffee/tea/smoothie and get a slice of chocolate mousse cake for a euro! Notes: Gets packed at night and weekends quickly – come early for a spot. This new spot is the sister restaurant to Distrito Vegano. It’s even more internationally themed, with Spanish foods only represented in a couple of dishes, with the rest spanning several continents. We had the honor of being invited to try their entire menu, and there wasn’t a dish we didn’t love. For full details, click here for the full restaurant review. Upscale vegan food in a fine dining atmosphere, across from Retiro Park. Lots of raw gourmet food but with cooked dishes as well. We came here to celebrate our anniversary and it did not disappoint. All the desserts are raw, but they do serve excellent coffee and tea. Come for: a special occasion. We suggest the lasagna, sushi, and black and white chocolate raw pie. Their café con leche de avellena (coffee with hazelnut milk) is superb. Notes: Expensive but delicious. Expect to pay more than twice your usual meal. Accepts reservations. No menú del día. This traditionally Spanish styled bar and restaurant has great food with a strong sensibility on preparing delicious faux meat. Expect a super savory punch to your taste buds with indulgent dishes with creamy sauces and rich garnishes. Even something that wasn’t normally our taste (mock octopus made from wild mushrooms) was excellent. Recently they’ve dropped tapas from la carta (regular menu) and exclusively serve for lunch and a dinner a menú del día. The chef/owner is very friendly and hails from Argentina. We recommend: specifically seitan dishes and faux meat dishes, like the chorivegano and milanesa. If they have empanadas – get them. They frequently feature the pulpo (mock octopus) as it’s one of their most popular dishes. Note: Takes reservations but haven’t had trouble with walk-ins either. This isn’t a buddha bowl spot – don’t come expecting salads and smoothies or the usual trendy vegan health fare. Opened within the last 5 months, this bakery cafe is stepping up the vegan game. With muffins, cakes, empanadas, brownies, the proprietor barely conceals a smile as first-time customers discover all the goodies from his self-proclaimed “laboratorio”. Also offers a menú del día (price fixed lunch) and raciones (sharing plates). Check out our restaurant profile for more info. Eating here will be an experience – no that is definitely not meat and definitely 100% vegan. We recommend: the menú and any ración, but don’t leave without trying the baked goods: the muffins, the empanadas, but hot diggity damn that cheesecake blew our minds. Note: tiny spot – just a couple tables but uses biodegradable takeaway containers. A new spot up that had a preview buffet at our time of trying. Peruvian food fans take note – they will have all the staples: papas a la huancaína, lomo saltado, ají de gallina, papa rellena, chifa ( Peruvian Chinese food) but also serves some Spanish bar staples like hummus. We recommend: all the aforementioned! An international franchise that’s locally run. Offers a menú del día and tapas. Tons of space. Come for: the kebab and stir-fry tapas – can’t recommend the menú del día, as we’ve been disappointed every time. Tread softly with faux meats – they can be rubbery. Notes: accepts reservations. Doesn’t serve alcohol. Vegan restaurant with a invitingly decorated wood-paneled interior and extra space in the back. The only vegan pizza spot that makes its own cheese. Unfortunately, they’re a bit pricey for what you get (15 euro pizzas) and the quality is inconsistent. Looked much better than it tasted, unfortunately. Come for: the 9.50 menú – often they serve pizza and calzones. We recommend: They’ve unfortunately have degraded in quality – we had a bad experience here last we went (many friends report the same). They didn’t have their usual menú, and the food just felt tired, sloppy, and stingy. A mushy veggie burger, a pizza topped with fresh basil stems… I dare you find any basil leaves in the photo above). It’s a shame because their pizza dough is really good, and the homemade cheese is on point. Notes: Everything is palm oil free. Menú del día doesn’t include a drink. A new all-vegan súper castizo style bar (typical of Madrid) located North of Retiro Park in the neighborhood of Prosperidad. Large space with bar seating, tables in front, and the back. Has an extensive carta (menu) that has vegan versions of all the typical Madrid bar offering i.e. croquetas, patata bravas, bocadillos (sub sandwiches) french fries, hamburgers but also arepas, salads, and wraps. Also a whole pizza section with 13 options. Expect friendly punky servers with a no-nonsense vibe. We recommend: almost anything, but expect rich and heavy bar food that pairs best with alcohol. For a homemade affair, go for the burgers, croquetas and pizza. If you want top-notch substitutions, get the “chorivegan” (vegan chorizo) or “nocalamar” (vegan calamari) sandwiches. Note: Will be slightly out of the way for most short-term visitors. If you can, it’s worth the visit. Allergens marked on the menu. They have an unconventional spin on traditional food, like unique Spanish tortilla and croqueta flavors. The Perro Gamberro tortilla is usually made with squash instead of chickpeas. We recommend: tapas, especially the unique tortilla, chorivegano (vegan chorizo), and homemade croquetas. Note: Small – make reservations for weekends as it fills up. A new spot by the same people who formerly ran the now-closed Botanique. They focus on vegan Italian dishes, like pizza, pasta, and calzones. A large space with plenty of seating – can easily accommodate large parties. Also come for calzones the size of your head. We recommend: The pizza menú del día and the menú del día. The pizza has great dough and sauce, and they’re improving their use of the store bought cheese. Originally we did not recommend the menú, but it has improved dramatically the last time we went, and we want to come back again. Note: Spacious but very popular. All vegan juice bar with smoothies and some tapas. We recommend: dessert, specifically amazing homemade peanut butter cup and cookie dough energy balls. Note: Very off center, will be out of the way for most visitors. Vegan chic bar with extra seating downstairs. We keep hearing mixed reviews – some people rave while other say pass. After eating here several times, we’re in the latter category. We find their pizzas quite bland and other dishes a bit strange. They do make some solid croquetas though at fair prices. Come for: earthy yet trendy ambiance, drinks, and their accompanying tapas. We can’t recommend the raciónes (sharing plates) as we were disappointed every time, other than the croquetas. Notes: Has a separate downstairs space for reserved tables. Cute local spot with a white tile interior bakery cafe vibe, famous for their homemade ravioli. Check out their bar for the latest baked goods on display. We recommend: el plato del día on Thursday and Sunday – handmade spinach stuffed ravioli for lunch, and their delicious tapas, specifically croquetas, patatas bravas, raviolis fritos (fried ravioli!). Try any sponge cake but also their cookies that will have you can’t believing it’s not made with butter. Collaborative social space that serves vegan pizza and burgers on Thursdays and Fridays. Will deliver food via bicycle. Come for: supporting the niche vegan community. Note: off-center, only open Thu and Fri 8:00pm-12:00am. They also have workshops like soap making, sewing, and bike maintenance. Juice bar slinging all-natural smoothies, homemade cakes, including lots of raw and gluten-free items. Come for: a break from indulgent vegan food in the stall’s earthy atmosphere while people watching in the bustling indoor Anton Martín neighborhood market. Note: Essentially a counter – just a couple high tables. A great local favorite that incorporates fresh, organic, raw and gluten-free ingredients. Has a menú del día and tapas, with gluten-free options. It’s hard to go wrong here, and it’s one of our favorite lunch spots, and one we show off to omnivore visitors. We recommend: the best menú del día – always with light and hearty options. Tapas can be a bit too pricey for portion size. The only vegan restaurant in Madrid with a terrace! We recommend coming here for a menú del día, where you can try what we consider the best veggie burger in town, completely made from scratch. 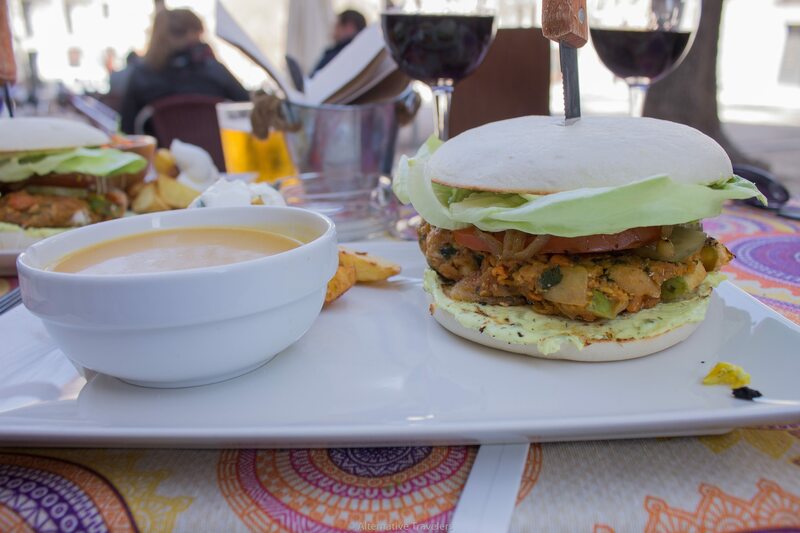 (Fellow veg blogger Wanderlicious agrees with us – and she’s tried 25+ veggie burgers in Madrid! Read her list of the best veggie burgers in Madrid). Even Laura of the Traveling Weasels agrees – it’s the best veggie burger she’d ever had. We recommend: the two menús del día: the menú burguer and menú internacional (their website lists the daily specials). You won’t get stuck with anything here, but the menú del día is the best deal. Do expect Spanish culinary sense with the international menú ie delicious curry that isn’t spicy. Note: Takes reservations. 10% markup for terrace seating (the norm everywhere). Feeling overwhelmed with the vegan choices!? Sign Up To Receive Our Top Ten Tips for Being Vegan in Spain! With so many vegan options, it’s hard to choose places that put us at a disadvantage. Often they have vegan “options” which means paying the same while removing dairy and eggs. Places rarely offer well-intentioned substitutions. Sorry vegetarians, but when we hear people rave about these spots, it’s always something smothered with dairy or eggs. (And dairy is scary. Eggs too.). That being said, sometimes we end up in a vegetarian place with a non-vegan friend and we are pleasantly surprised. While one or two good options don’t beat out an entirely vegan menu, if you do end up at one of these spots, this is what we can recommend. Inside the Mercado San Fernando is an inconspicuous tiny spot offering a 95% vegan menu, with vegan items clearly marked with a green circled V.
Note: Tiny, has a couple high tables, essentially just a deli counter. Open Wednesday – Sunday, but weekend nights are the best time to go as the market is bustling with night life. The sister restaurant of La Hummeseria (see below). Coming from New York, we know a thing or two about falafel sandwiches, where it’s a common street food we frequently devoured. However, these Israeli proprietors definitely know a few things more than us when it comes to making them. With plenty of seating and beverages options, you’ll wait around five minutes until you’re summoned to choose from a variety of fresh and pickled toppings to stuff into your sandwich. Easily the most authentic and delicious falafel on offer in Madrid. We recommend: their deliciously layered falafel sandwich, of course. They also have vegan seitan and mushroom shawarma that will not disappoint. Expect hearty filling portions. Note: they have salsas picantes (hot sauce) that are actually hot. Spanish foods generally shy away from any amount of spicy hot. Solid vegetarian food made with local ingredients. Expect dishes that primarily focus on one vegetable, like bean soups or roasted potatoes. A solid lunch option near the Museums. Vegan options are clearly marked. The only place that gives you a full carafe of wine! A win for the Sam. Hard to beat that full carafe of wine – easily four glasses! Come for: A menú del día – offers at least two options per course. Notes: Plenty of seating. Make sure to double clarify if food is vegan – especially dessert. Near the museums. Comida ecológica (organic food). Cozy laid back and tucked away grocery store and restaurant. There are two other locations: both are a juice/smoothie bar with sandwiches. However, this listing is the restaurant on Calle Moratín. A vegetarian restaurant we can appreciate because they offer real vegan options and quality vegan substitutes. We recommend: the menú del día, as it’s very filling, well done, and a just a tad indulgent. The only complaint is they have one vegan dessert that’s usually not there (we checked many times), and the coffee kinda sucked. Note: Easy to miss as at first glance – looks like small a grocery store but there is table service in the back. Hummus is the star of the show, with some vegetable sides. Many vegan options. Can seat large groups. Come for: the specialty hummus, like roasted mushrooms, and pesto. Notes: accepts reservations and can seat large groups. Super popular local socialist and anarchist hangout that always seems crowded as it has super cheap but quality raciónes. Best to come on a weeknight for a drink or two. We recommend: the raciónes, especially patatas bravas, salmorejo, and hamburguesa lenteja (fried potatoes, cold tomato soup, and lentil burgers). For 1.50 more the burger comes with fries and a drink. Notes: cash only. Also has the local vegan artisanal beer, Veer. Tiny tucked away spot where the formally Botanique (now Pizzie Dixie in Malasaña) was. Has a menú del día. In the Mercado Anton Martin. The gregarious owner from Venezuela really makes you feel welcome. We recommend: the meriendas (snack special), as the cakes were excellent – get a tea/coffee with cake for a couple euros. We wish we could recommend the tapas or menú, but the portions were way too small for the price, despite being very tasty. Notes: Very tiny – takes reservations. Inside the Mercado Antón Martín. We witness only vegan food being served here, but Happycow reports this place as vegetarian, so to be safe we will list it accordingly. Very brunch-y expat favorite with a rustic vibe. They usually have a vegan cake on offer and a variety of veggie milks. Sadly not a ton of vegan options, as most things come with eggs or dairy. Notes: Super crowded on weekends. This is probably our favorite vegetarian restaurant in Madrid to date. If you seek tranquility, this is your spot. There’s table for diners, couches for tea, and even a meditation space in the back. All the prepared food is vegan but they have cow’s milk and honey available by request for vegetarian tea drinkers. We recommend: The menú del día, which consists of the Tiyoweh plate, beverage, and dessert. The plate varies every day, but expect super fresh sampler plate of food ranging from scalloped potatoes, mushroom risotto, mixed green salad, hummus, with super soft whole wheat bread. Once we had a surprisingly delicious sweet potato and beet soup – previously unheard of combo to us. A regular staple of the old vegan-friendly vanguard. Greasy Chinese food that caters to Spanish taste buds. We’re not fans but its a regular classic among local Spaniards. Come for: the weekday buffet, as the menú del día will be retrieved from the buffet anyways. Notes: Tons of Seating but gets super busy on the weekends. Sells frozen faux meats. Super trendy spot in Malasaña that serves up high-quality faux meats from Huera. It can be hit or miss. Our friends behind online vegan cooking classes Brownble at first had a great pad thai here, but when we went it was quite bland, and when they went again they said the same. Come for: the excellent desserts (at least one or two vegan options), but it’s hard to recommend overall, as it’s very pricey for small portions. They usually have one vegan option for the menú del día. A small vegetarian restaurant inside the Mercado Tirso de Molina that shares a kitchen with a non-vegetarian restaurant. We came here on the pretense that it was all vegan – their website is not clear about this and they had been listed as vegan on other sites. It has since been corrected on HappyCow. Come for: if you’re in the area and really missing Mexican food – the sauces and moles are done right. However, we really can’t recommend it. The food is good, but way overpriced with tiny portions that will add up if you wanted to leave full. The location will be out of the way for most visitors. Note: Loves to give a sob story about how hard vegan desserts are to make. A very tucked away spot in the heart of Madrid. Has some actual vegan options that aren’t just vegetarian sans dairy/egg. Very accommodating to vegans and celiacs. To their credit the salmorejo is one of the best we’ve had. Come for: tapas like salmorejo – request sin huevo (cold tomato soup sans egg), berenjena rebozada (fried breaded eggplant) with vegan sour cream. Notes: Gets crowded. Has two locations. Posts their menú del día online for the month – often is mostly vegan. In the US, bars don’t always serve food, especially in NYC. But here in Madrid, every bar serves food and virtually every place that has food serves alcohol. However, some are more about restaurant service. The line isn’t always clear. While most of the vegan restaurants in Madrid are sit-down restaurants, or “bar restaurants”, they discourage standing room, as serving food to people at tables is their priority. Understandably, they want to avoid clogging their service pathways. For example, don’t expect to go B13 just for drinks – you have to get a table as you can’t sit and drink at the bar. We feel that when it comes to bars, the vibe and ambiance take even more precedence. We tend to gravitate to divey spots, but we’re down for anything chill. These places intentionally serve vegan options or are really accommodating upon request. For more on vegan and vegetarian tapas in Madrid, check out our vegan tapas guide. If you’re looking for a drink and some light bites para picar (to pick at), look no further. Check our Top Ten Tips for Eating Vegan in Spain! Here are the most well known places offering the best vegan options. Update: Now sporting a separate all vegan menu! Local pizza spot in Malasaña with limited seating. Great and affordable vegan pizzas with vegan cheese! We recommend: any pizza, but the margarita, the bbq, the mediterranean are fantastic. Also a spot on fried eggplant sandwich (though it could have used some sauce and cheese). Sandwiches come with fries for a dollar more. The empanadas are a must as well (they legit import the dough from Argentina). Best deal for vegan pizza in Madrid in our not so humble New Yorker opinions. Note: Small – just a couple tables. Very local divey spot with an impressive selection of delicious homemade tapas. They are very vegan-friendly, listing all their vegan items on a chalkboard by the kitchen. They also offer a weekday menú del día, with two options for every course. We recommend: a few round of drinks, like their homemade sidra (hard cider) and the accompanying tapas that upgrade every new round (one of the few places with many vegan options that does this – see more in our guide to vegan tapas in Madrid). If you’re looking to dine with omnivore friends who refuse to eat vegan food, this place is a solid option. Note: Southeast edge of the city center – may be too far for those staying/living in the North. This celiac approved, entirely gluten-free cafe serves a whole range of savory and sweet delights. Vegan goodies are marked. A nice respite from the very crazy Gran Via boulevard. Coffee is decent but the real star here is this decadently rich vegan chocolate cake with white chocolate icing – it’ll get ya comatose. We recommend: the amazingly rich chocolate cake and the incredibly soft bread if you can splurge on it. Note: counter to-go service and ample seating for table service. This recently opened draught craft beer bar sports a rebellious atmosphere to match the name (after the band Rage Against the Machine). La carta (regular menu) is mostly vegan, with a few options that include fish or cheese. Come for: punky rebellious vibes and locally made craft beers, and international ones too – a beer from the Basque diaspora in Boise, Idaho! We recommend: the beers on tap, and the tasty aperitivos (free mini tapas that come with your drink). We applaud their vegan-friendly efforts, but all the veggie options were under-portioned and overpriced. In their defense the ingredients were quality and fresh, and the pan ecológico (organic bread) was excellent. Just expect your lightly smeared vegan toast to look sadly meager next to your friend’s that’s piled high with tuna. Note: Get crowded quickly. If their full, ask for a seat and they’ll queue you up at the bar with a drink while you wait. Casual fast food prepared and served by a small army from an open-air kitchen in an interior of exposed infrastructure, with hanging plants, and a barista station inside a small European truck. We felt like we had stumbled into New York City – except we could actually afford the food. Popular with expats but likely a concern with Spanish locals as apparently there will be another location opening in the center very soon. This reminds us of the Create-Your-Own-Salad bowl type spots that dot every other block in neighborhoods of Manhattan we could never afford to live in. Come for: Solid vegan options and quality food, in a loud, hurried and bustling atmosphere (the antithesis of Spanish dining). Veggies are fresh but oil coated. Get the grilled tofu – a market plate with two sides if you want to leave full. It’s solid food – but why come to Spain to not eat like the Spanish? Unless you’re living here, we’d give this a pass. Note: Very north of the center, but next to the Estadio Bernebéu. Our biggest gripe: mislabeling “plant-based” items that contain animal products. The word they are looking for is “ovo-lacto vegetarian” or “not vegan.” There are vegan items labeled – but be careful, as they advertise explicitly vegan products on nonvegan products, which is confusing at first glance. Either they should change the labeling or change their name to Dishonest (or Misinformed) Greens. Local bar in the heart of Lavapiés with lots of vegan-friendly options. Their specialty is different types of non-traditional bread sandwiches, including pan chapata (ciabatta) and noriega (Norwegian style). Come for: a seat at the bar with drinks, tapas, and cake. Tortilla quality varies and “pizzas” are more like open face chapatas with toppings. Mushroom croquetas are their best bet. This is not a place to try to impress your nonvegan friends with vegan food – take them to one of the dozens of all vegan restaurants in Madrid. Note: 10% surcharge for table seating (not typical). Gets very busy. They have a couple outdoor tables if you can manage to snag one. We tend to avoid sorbets and go for the plant milked based flavors unless they’re naturally creamy like mango and coconut. Ask the server which flavors are vegan. We recommend the mango. We checked out this place with fellow vegan and sustainable travelers We the Wildflowers when they were in town. We recommend the salted caramel and coconut. These are plant milked based and super creamy. The salted caramel tasted almost too good to be true – you could fool omnivores with this one. Entirely separate vegan case. Ask server for descriptions. Flavors are super fresh and change daily. Allergens clearly noted. If you’re looking for an authentic churros experience but vegan, you’ve got one true option (that we’ve found, anyway). Sure, churros are accidentally vegan, but you’re not having the traditional experience without a cup of dipping chocolate. Here you can order the dark chocolate, which is made without milk. Which means more chocolate. Get em skinny (above) or get them fat (porras). Dipping chocolate is a must – ask for the dark chocolate – no dairy in it! We recommend: the skinny ones and the porras (the fat ones). Watch them make them it fresh. Note: Plenty of seating and rarely full. We’ve witnessed Madrid become more and more vegan-friendly even just within the year that we have lived here. Lately, we’ve been finding new intentionally vegan products in mainstream Spanish supermarkets, such as in Mercadona, a Spanish chain, and Lidl, a German-owned chain. Also, herbolarios (health food stores) tend to dot every block and usually have some vegan products, along with vitamins, supplements, and usual health-oriented fare. If you find yourself living in Madrid, or looking to make a meal at home while you visit, there are some great all vegan stores you should patronize. You’ll think you’ve arrived at a plant-based world if you woke up in this store. Typically Spanish markets have one of everything, but not here. We come here frequently for our favorite vegan goodies we can’t find anywhere else. We recommend: Provamel nondairy products, Violife cheeses, Sheese cheeses, parmesan-style cheese, Vegourmet cheeses, kilo block organic tofu. Also has tempeh, flavored tofu, veggie burgers, lots of faux meat including many types of vegan chorizo. Note: Also offers non food products, like chapstick, clothes, hygiene, etc. An all vegan store similar to Planeta Vegana, but for if you find yourself up around Malasaña. Come for: vegan products, of course (carries a lot the same as Planeta Vegano). Note: It was slightly smaller but has recently expanded. Like the two above, but much more off center, and much tinier. We recommend: The squash based dried chorizo “Calabizo”- no funky fillers or preservatives and adds a flavor burst to any stew. Has similar products, but much smaller than the other two. We recommend: the amazing croquetas, and generally any prepared vegan food. An oasis in the 4- 8 pm Spanish food dessert. For more on vegan options at other supermarkets, see the Madrid Vegan Guidebook. Burger from Botanique (now Pixxi Dixie)! If you made it this far, congratulations! This is an epic post, but Madrid deserves it. We update frequently with new finds, so stay tuned. There’s such a great vegan scene and community here and tons of resources if you know where to look. Truth is, there are even more vegan options to include. If you’re short on time this is a lot of info to wade through. And you may not even have internet access as you explore Madrid. Vegan Tapas Guide to Madrid. Tapas are inaccurately represented outside of Spain – click here for the real scoop. Guide to Vegan Menús del Día in Madrid. This cherished and affordable tradition would be a luxury anywhere else and mostly unknown to tourists – check out the article to see why. Madrid Vegano has tons of articles in Spanish and some in English. The Nomadic Vegan’s epic Vegan Guide to Spain has tons of helpful vocab and traditional naturally vegan Spanish dishes. *Editor’s note: This post was originally posted in March 2017 and has since been massively updated.